From Franklin, Wayah Road gains a thousand feet in elevation before reaching Nantahala Lake. It's a curvy twenty-one-mile drive that takes about 45 minutes. 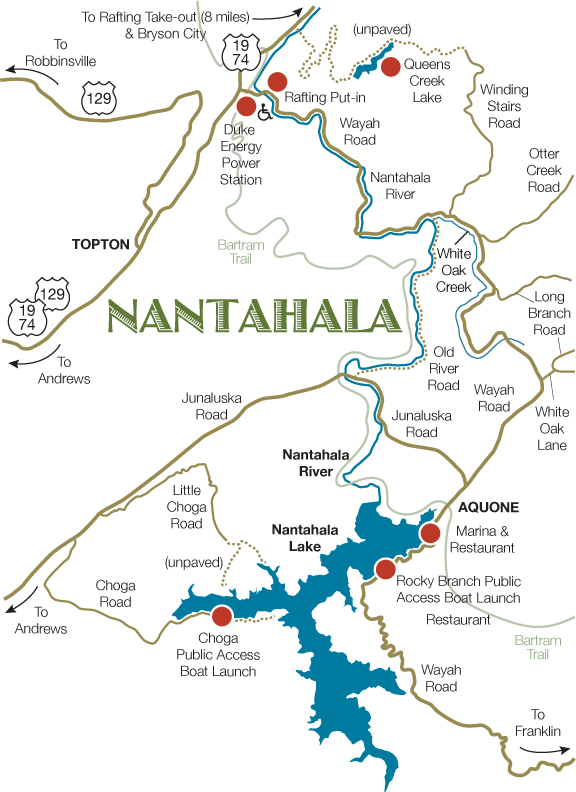 At 3,035 feet, Nantahala has the second highest lake surface elevation east of the Misissippi. The Lake covers 1,600 acres with over 30 miles of shoreline, much of which is Nantahala National Forest. Wayah Road continues down the mountain to US 19/74 and the floor of the Nantahala Gorge – an equally curvy fourteen-mile drive that takes about 25 minutes and drops almost a thousand feet in altitude. See Nantahala's location in relation to the surrounding towns. Is it Topton or Nantahala? Because the Nantahala community is served by the Topton, NC Post Office (28781), some homes and businesses use a Topton address while others use Nantahala. In the eyes of the Post Office, both are correct.